The World Congress for Hair Research gave us the opportunity to spread awareness of Capillus laser therapy for the treatment of hair loss and hair regrowth to the eastern market. Capillus, LLC introduces its newest laser therapy cap for treatment of pattern hair loss, the CapillusRX™, to hair-restoration physicians in Asia at the 10th World Congress for Hair Research (WCHR) which was held in the beautiful and historical city of Kyoto, Japan earlier this month. 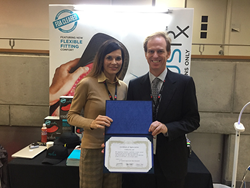 During the Congress, Capillus proudly showcased the FDA-Cleared CapillusRX™, which contains more lasers than any low-level laser therapy device in the market for home treatment of hair loss. Its 312 diodes provide maximum simultaneous coverage of the scalp by any device for treatment of hereditary hair loss. It is available only through the company’s global physician network. Representing Capillus at the congress was the company’s international team composed of industry veterans Fernando Bermudez, Director of International Sales, and Lisa Weaver, Director of International Distribution. Prior to joining Capillus, Bermudez was a top executive for a prominent chain of hair clinics in Europe, and Weaver was a director for international distribution at a well-known manufacturer of clinical skincare products. During the WCHR, the Capillus team demonstrated its full-line of mobile laser therapy caps which have been clinically proven to help in hair loss prevention and hair regrowth. The Capillus team met with distributors from around the world who were eager to learn about Capillus and how laser therapy can be applied to preventing hair loss and hair regrowth. The World Congress for Hair Research, which is held every two years, took place in the Kyoto International Conference Center. Attendees included hair biologists, tissue engineers, dermatologists, aesthetic scientists, and hair transplantation surgeons from around the world. Also in attendance were international exhibitors who presented the latest advancements in hair care and hair restoration products. In addition to its CapillusRX™ available only through its physician network, Capillus currently offers three FDA-Cleared laser caps for direct sale via http://www.capillus.com: 1) Capillus82™, an economical and convenient device with 82 laser diodes, 2) Capillus202™, a powerful yet affordable device containing 202 laser diodes, as well as 3) CapillusPRO ™, a professional-grade device with 272 laser diodes. Capillus laser therapy caps use Low Level Laser Therapy technology (LLLT), which is a non-invasive and chemical-free medical treatment for hair loss. The Capillus laser therapy caps use a six-minute protocol which greatly reduces the time it takes to receive treatment.